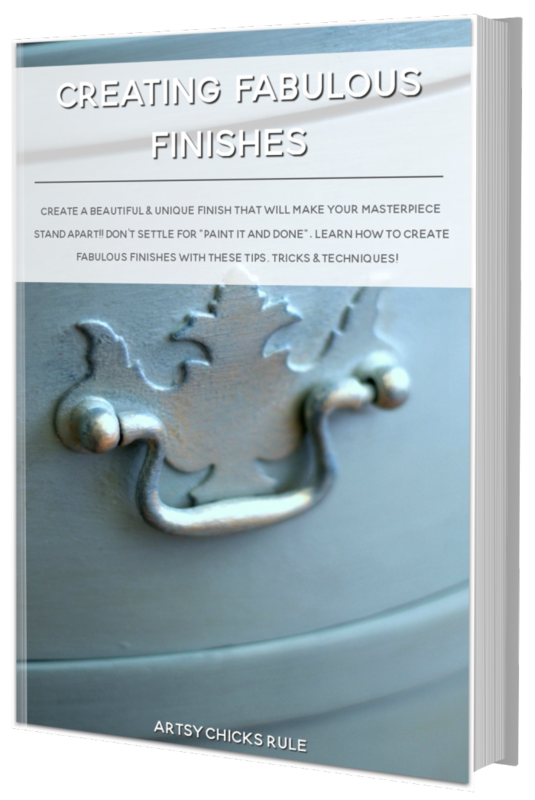 I love paint for furniture, and what’s even better …. 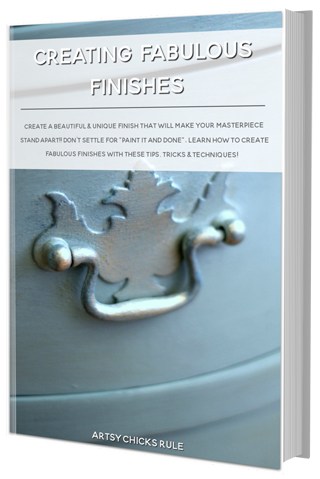 metallic paint for furniture! 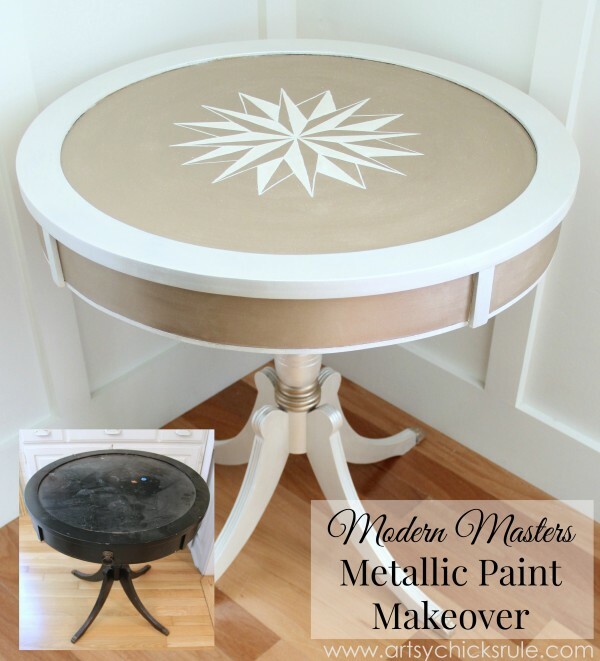 I’m sharing a review on Modern Masters Metallic Paint today. On Friday, I posted a little teaser photo of something I’ve been working on, over on Instagram. I was compensated with product and/or payment to review Modern Masters Metallic Paint. However, all opinions are 100% my own. I was asked awhile back if I’d like to review the Metallic Paint Collection by Modern Masters. I LOVE paint, so of course I said yes! I had two color choices and decided to go with Oyster and Warm Silver. I had a terrible time choosing….there are so many fabulous colors. And honestly, I really can’t wait to try more ….but I’m getting ahead of myself. Let’s start with a close up “before photo” of the table I chose to paint. 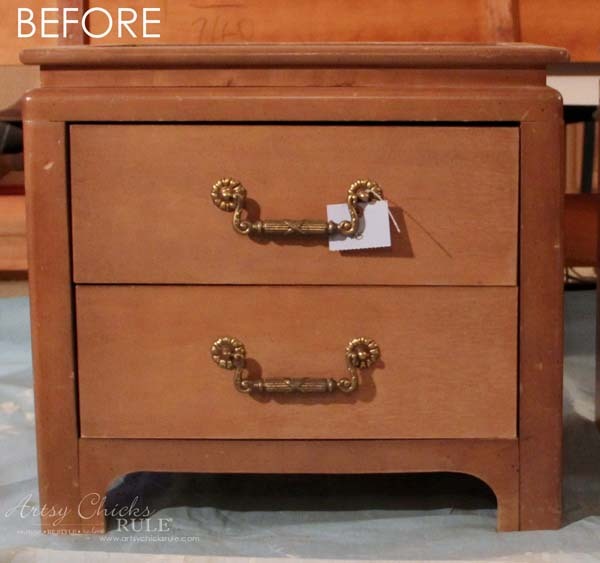 It never ceases to amaze me what a little paint can do for a piece of furniture. And in this case, metallic paint. I picked up this piece at a favorite thrift store of mine for $3. Three whole dollars. But it wasn’t looking so good. Someone had spilled glue and nail polish on the top and I had to sand to remove it (after I chipped most of it off). It was also a little “wonky” but a few tighter screws later, all is well. Since this table was black I decided to spray it with a white primer before painting. I chose to use both colors and go for a 2-tone finish. The Warm Silver had super fabulous coverage since it’s ‘opaque’. The Oyster had a little less coverage but it was supposed to since it’s ‘semi-opaque’. The Oyster is a gorgeous shade and I can see using it over metal and so many other things for a hint of shimmer. Beeaaauuutiful! 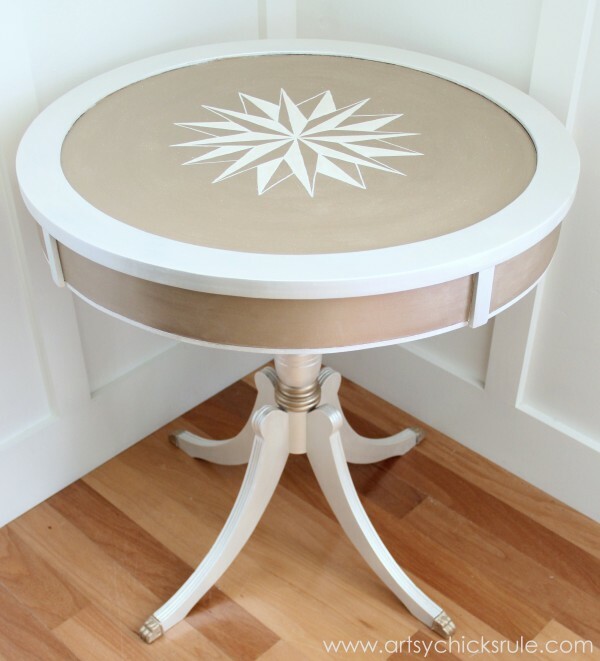 I loved the round shape of the table and decided it needed a compass rose right in the middle. 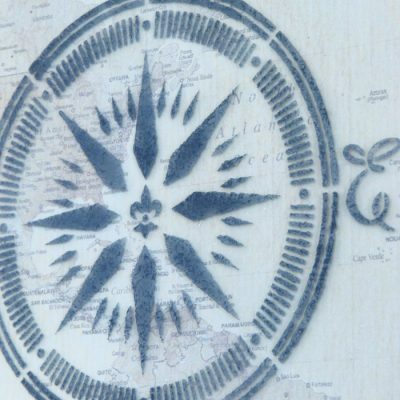 I used a white watercolor pencil to draw the compass rose and hand painted in with Oyster. 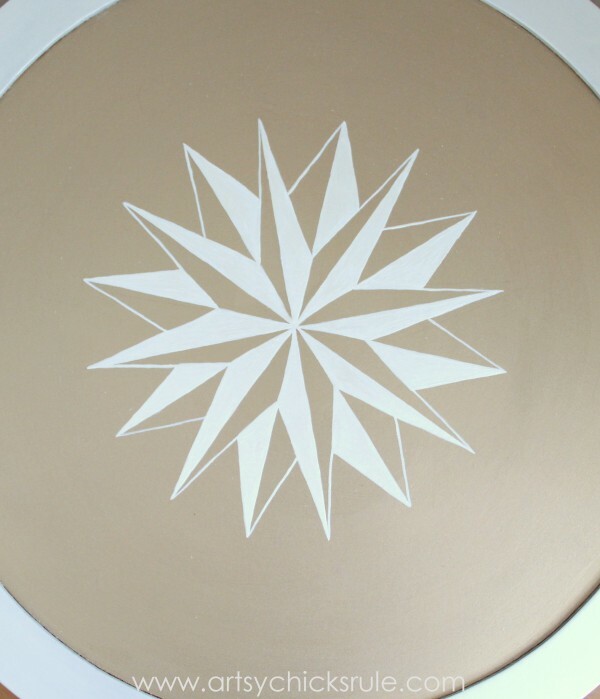 You can see a full tutorial on how to draw/paint a compass rose in this post here. Isn’t that Warm Silver luscious? It’s a bit more gold than I had envisioned but it ended up being a lovely contrast to the Oyster shade. So how did I like the paint? I loved it. It went on like “buttah”…really, it did. I have no better word to describe it. That is the word that popped into my head as I was painting and so I had to be true to it and say it here. I had never contemplated metallic finishes much before….but I’m really loving them lately. And I’m thrilled to have been introduced to this fabulous Modern Masters Metallic Paint! How about you? Are you a metallic paint lover? Do you own any metallic painted furniture? UPDATE!! You can see them now, here! Wow – what a beautiful table and only $3 what a great deal. Gorgeous table! It was steal at $3 but you have made it look like a million bucks! 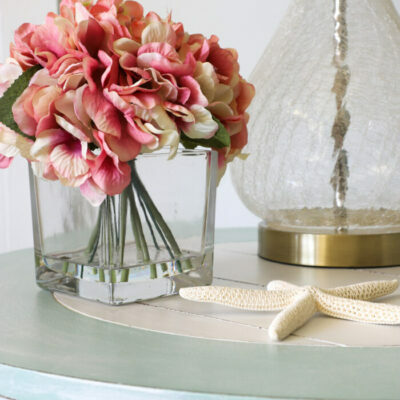 What a beautiful end result for this pretty table. I can’t believe that table was only $3, what a deal. 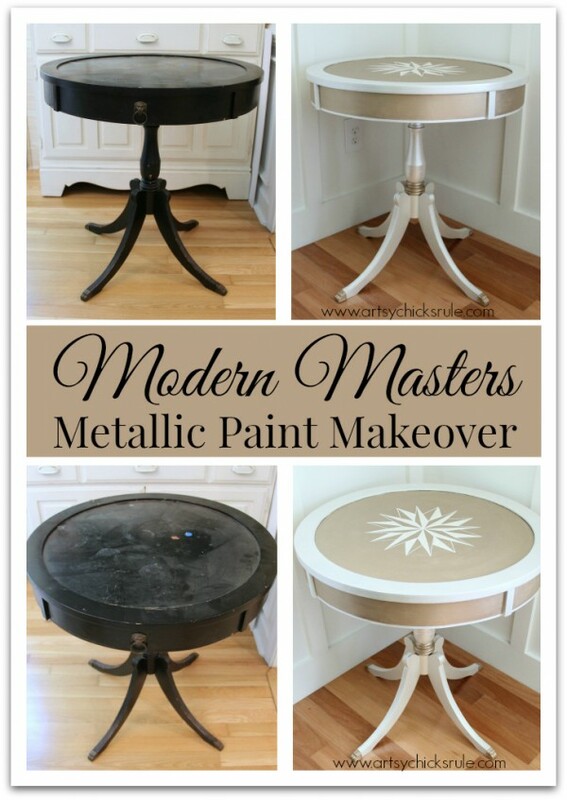 I love the metallic look and want to try Modern Masters paint for myself. This turned out gorgeous Nancy! 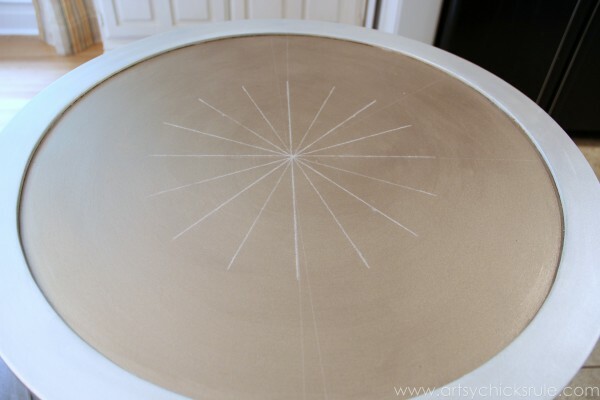 That color is beautiful and now you have inspired me to try a compass rose! Thanks Shanna! :) Oh yes, they are fun to do! Your table is spectacular. Using the two colors together was inspired. I like how you dressed up the legs, too. 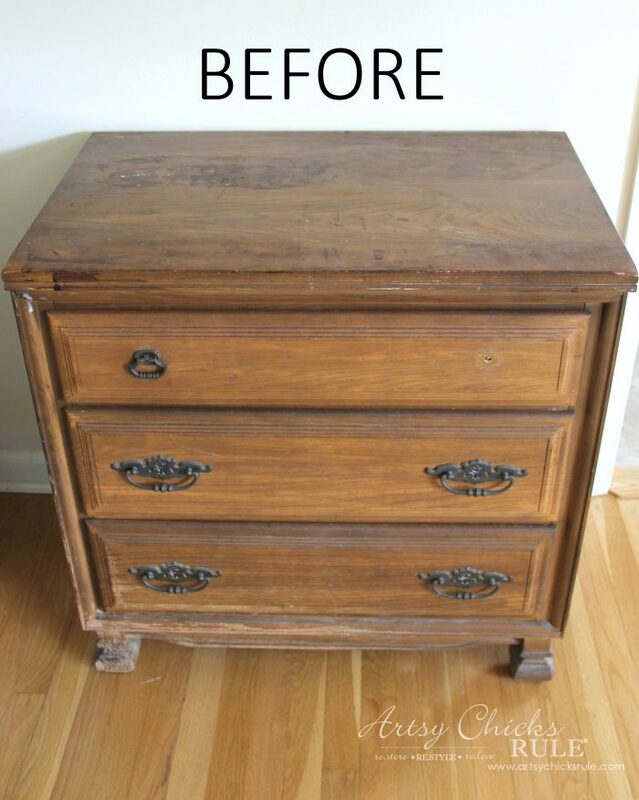 I just finished an antiqued silver nightstand. 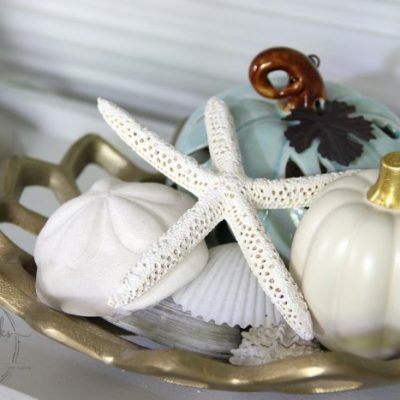 I used Martha Stewart’s metallic paint (the small pot available at Home Depot). While it went on very smoothly, every brush stroke showed. I even bought good brushes (Wooster and Zibra). I ended up using four coats of paint on top of two coats of primer. I wasn’t too happy having to put on so many coats or with the brush strokes (and I sanded in between). I have two more pieces that I want to use the same finish on but I might try Modern Masters instead. So if you don’t mind, I have some questions for you. How was the coverage of the opaque paint and how many coats did you need? And did you brush or roll on the paint and did you have brush strokes? Thanks for sharing your gorgeous project. Yes, the first metallic paint I used was Martha Stewart’s and it was quite a challenge to get it to cover well. I think I probably used about 4 coats too. I think you will tend to get some brush strokes with any metallic paint. It’s just the nature of it. BUT, with that said, I had much less trouble with that with the Modern Masters paints. So a good paint brush is definitely key. I like Purdy best. The coverage for the “Warm Silver”, which is listed as “opaque” was FABULOUS. The coverage for the “Oyster” was not the same but it was to be expected since it was “semi-opaque”. The Oyster would be fabulous for highlighting metal or woodwork…and works very well over light colors. I actually like it best. :) But keep in mind these are the only 2 colors I’ve tried so far. I will be trying more though. I typically don’t use a roller much anymore but you could try that. I’d be interested to hear how that works with the metallic. Might be a good choice! Thanks for the quick reply! I’m glad to hear that you’ve used the Martha Stewart paint so you know first hand how it performed. While I didn’t care for the brush strokes, it was more that the finish was very uneven. Even after the 4th coat, there were very obvious light and dark areas–especially on the top. And every change of brush direction showed (like painting the edge and then painting the top–if any paint from painting the edge got on the top, it showed). I’m glad that I chose a small project to start with because the next two are a china cabinet and a 9-drawer dresser. I definitely will try Modern Masters next. I see that they have a clear coat that will keep the metallic quality of the paint. I think I will try that on the nightstand top to make sure that things don’t stick. WOW! That is a lovely and amazing transformation! 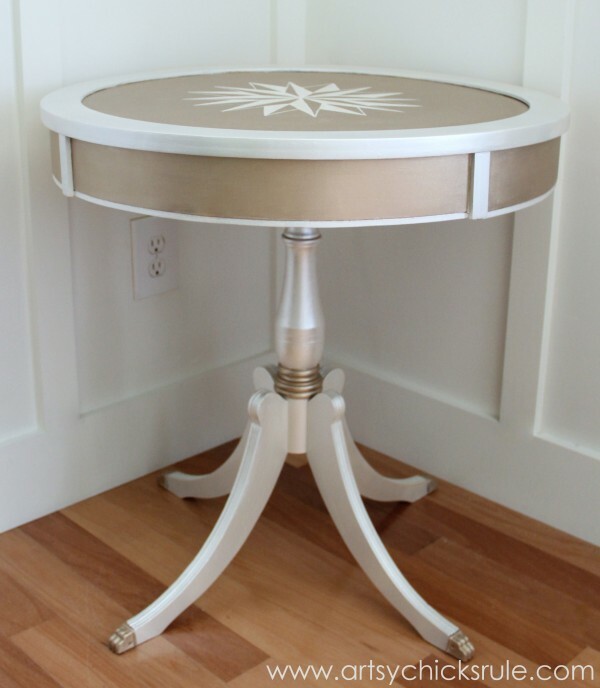 That table is gorgeous now and that stencil really tops it off! ;) I LOVE Modern Masters! I have used their paints before and they are the bomb! Thank you Julie! :) They are great…I look forward to trying some of the other colors now! Oh my!!! The table is simply amazing!!! You’ve done an incredible job with it!!!! Even my husband, who is VERY sceptical about all this, thought it was beautiful! I REALLY like it!!! Aw thank you Tess! :))) So glad you like it!! Oh my goodness!! Nancy this table turned out so gorgeous, it looks so expensive! I love Modern Masters paints and have been using them for several years now, but their metallics are ahmazing. They have more colors, I think I may need to add to my collection. I am sharing this on FB, so gorgeous! Thanks Karen!! :) I know, I might be hooked! I’ll be trying some more colors too!! Love the table! It turned out beautiful! 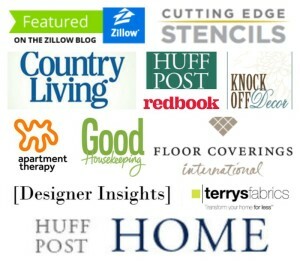 Love the compass rose! Thank you Crystal! 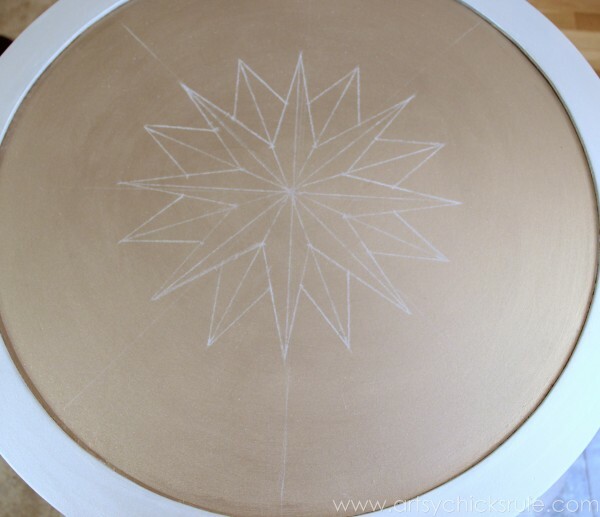 :) Compass Roses are my favorite…and really not hard to do at all! 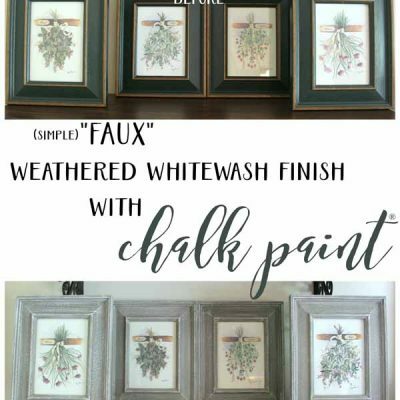 I love this project and am a huge fan of Modern Masters paints… I’ve been using them for about a year and they hold up well. So glad you showed how to make your compass rose.. I’ve always wanted to do one. I always enjoy your painted treasures! Compass Roses look complicated but they are sooo easy to do!! You can do it! 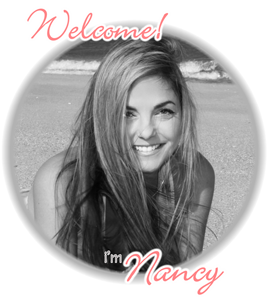 She is a beauty, Nancy!!! You are very talented my friend! You did it again….another beautiful piece! 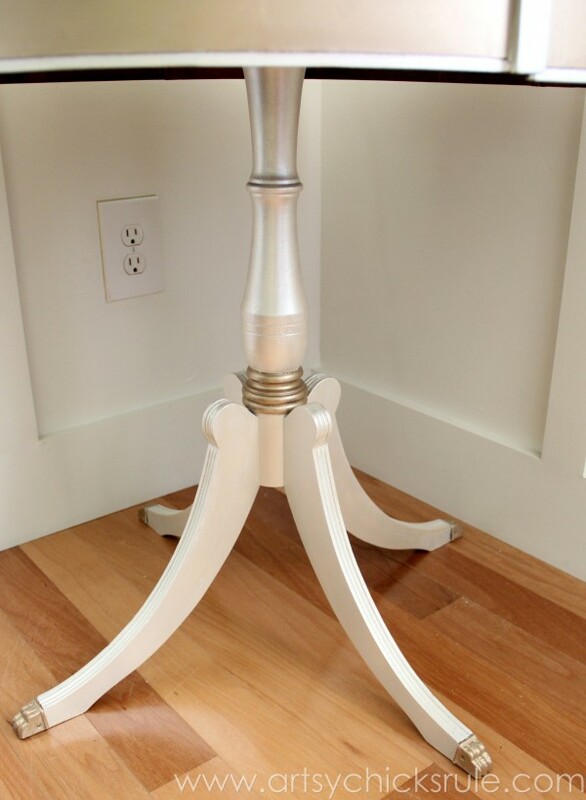 It’s hard to believe that gorgeous table had such humble beginnings! You are so talented! Wow Nancy, what a difference! Love the warm silver and oyster combo – so soft and pretty. 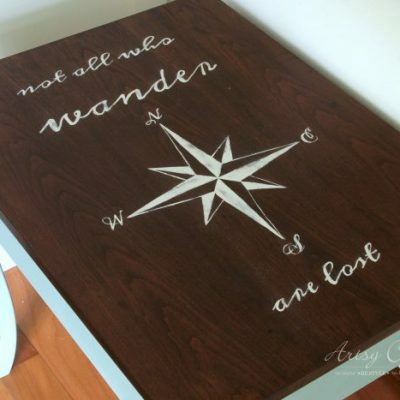 I remember the compass rose you painted on another piece and it looks gorgeous on this one too. 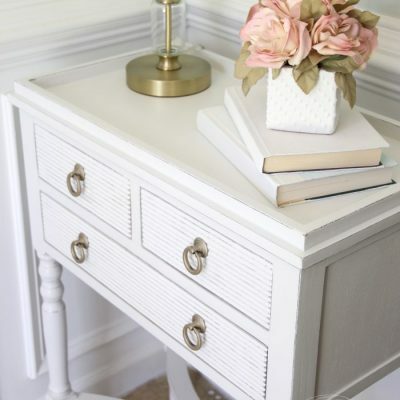 I’ve never used Modern Masters paint but this pretty makeover has certainly peaked my interest! I was never much for metallic finishes in general but this has certainly changed my mind! It’s an elegant and subtle metallic which I love! OK… this is spectacular!!! I have been looking for metallic paint for a project I am doing in a few weeks. 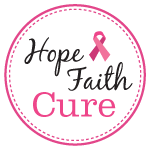 I am going to check this line out, it looks like the perfect product! I love furniture that has something “extra special” about it. And this has that “extra special” touch with the compass on top! Love that!!! This turned out amazing!! 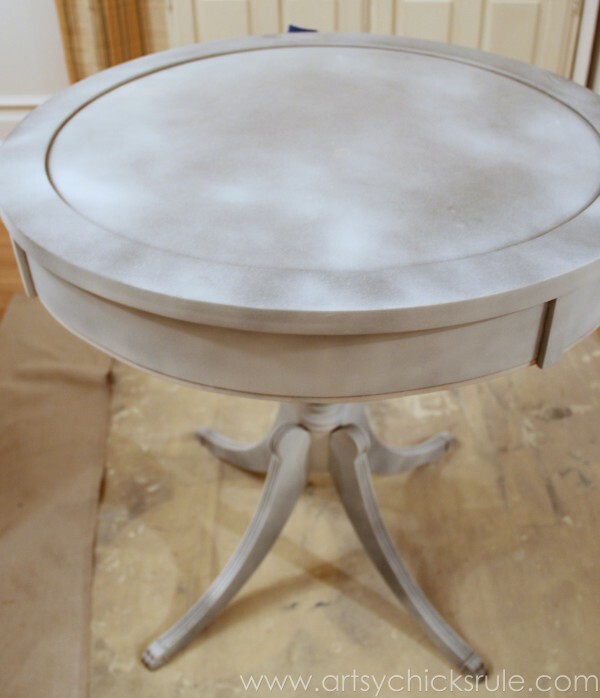 I love the color combination, I’m thinking on using it on a table I have laying around in my house that is about the same size as yours, so I was wondering how much paint did you use for the project and which primer did you use. 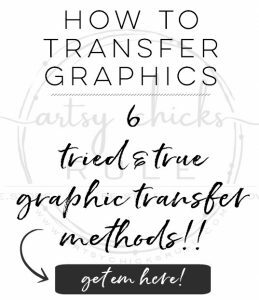 Could you recommend which brushes to use and where I can get them? This paint went a long way actually! I have the small 6 oz Oyster and maybe used 1/4-1/3 of it. And the large 32 oz in Warm Silver, somewhere in between 1/8-1/4. 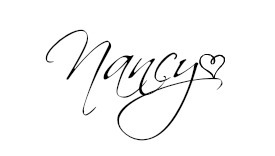 Nancy you did a fantastic job on this!!!!! It looks beautiful. nancy- this table turned out amazing! i love that you used a compass rose on the top and choice of colors..perfection! It looks now like a million bucks. Amazing. When I saw this table, I thought to myself, that looks really familiar. Why, yes! That is because the same exact one is sitting in my garage right now waiting for it’s transformation! It was my great grandma’s table that my mother just recently gave to me. Yours turned out amazing! Love the two toned and metallic! 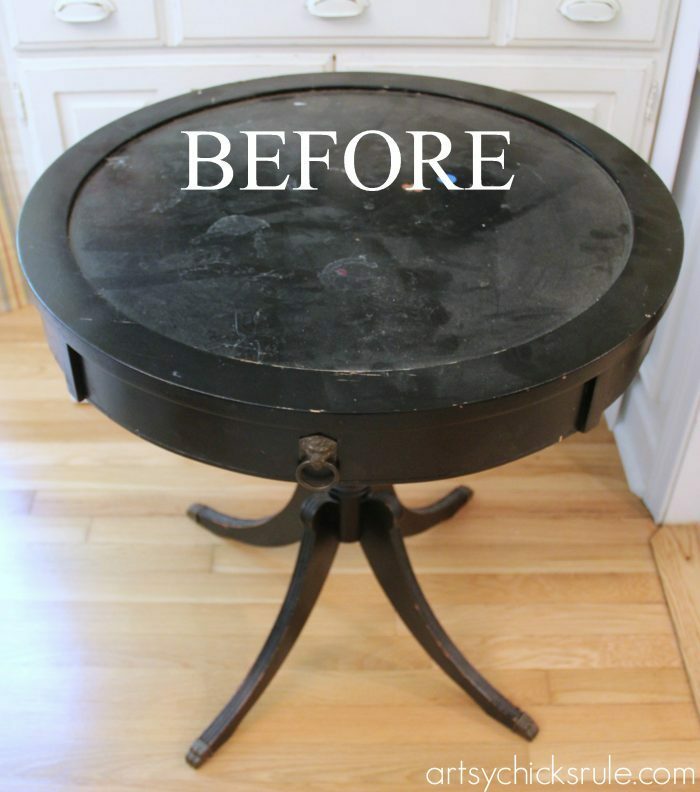 I was so impressed with your before-to-after, I just have to do the same with a table I have like it! And another table. And a chair. And a desk. :-) (I did take a GIANT gasp as it’s rather pricey.) Anxious to get started ! Aw that’s so sweet Patty!! :) Have fun!! You will love it! I used once and having a hard time getting it on before it dries. and then areas are darker when i go over any help? Hmm, it is a little different to work with. I did notice you have to be purposeful with your strokes when painting. (probably due to the metallic finish) I think metallic finishes can be a little picky in general. But knowing that going in helps. I just made sure to be very systematic with my brushing and applying it. The center area was done in “swirl” swipes etc. As far as it drying before you finish…try using a larger amount of paint on the piece to work with. Especially if you are doing a large area. You need time to work the paint over the whole surface and go back and perfect your brush strokes before it dries.